The name is applied to a wide variety of cookies or confections made primarily of egg whites and almond powder. Coconut powder can also be substituted or used in combination with the almond powder. Macaroons are quite simple to prepare. Most recipes involve foaming egg whites and sugar to the desired stage and then folding in the inclusions before depositing and baking the batter. 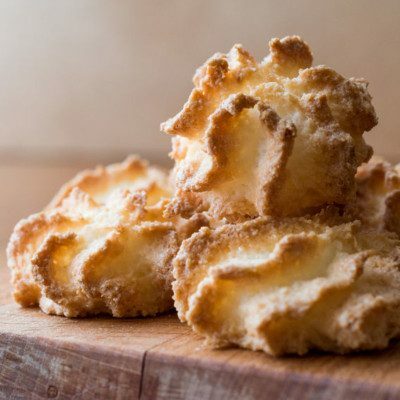 * Macaroon coconut is finely ground or flaked, unsweetened, dried coconut. There are hundreds of variations of macaroons throughout the world. Every region has adopted its own style or formula. Some popular inclusions are chocolate and coconut, which is common throughout Europe, North America, and Australia. In India cashews are often used. The Spanish type is made with hazelnuts and honey often added to the recipe. All these variations have led to an inconsistently defined product. For example, in the United States, macaroons are dense and chewy, while in France, they are light and airy, and often made without coconut. Ingredients such as cream of tartar or other acidulates may be added to increase processing tolerance and stability of the egg foam. Care should be taken that the eggs are at room temperature for ideal development and incorporation of air cells in the batter. All equipment coming in contact with the egg whites should be completely free of water as water will disrupt the foam. Equipment-product contact surfaces can be rinsed with vinegar to remove any possible fat contaminants. Jones, Bridget, and Robuchon Joël. “Macaroon.” New Concise Larousse Gastronomique: the Culinary Classic Revised and Updated, Hamlyn, 2007, p. 700. Gisslen, W. “Cookies” Professional Baking, 7th edition, John Wiley & Sons, Inc., Hoboken, New Jersey, 2017, pp. 483–517. Suas, M. “Cookies” Advanced Bread and Pastry: A Professional Approach, first printing, Delmar, Cengage Learning, 2009, pp. 400–441.